Accidents occur every day of the year. When you are in an accident with an 18-wheeler, your life will be turned upside down. With many tractor trailers weighing over 80,000 pounds, you have a much higher risk of death or severe injuries. While the driver of the truck will be well protected, chances are those in other vehicles will not be so lucky. When you are in an accident with an 18-wheeler, there are a variety of procedures that need to be followed to ensure that you are able to seek compensation for injuries or deaths that may have occurred. Medical Attention: The very first step to take is to seek immediate medical attention. Injuries involving trucks of this size can cause internal or external injuries including spinal cord injuries, brain trauma or broken bones. Contact a Lawyer: If you are in an accident, you will want to contact a lawyer immediately upon being medically stable. Trucking companies have law firms that they hire to protect their rights. By calling a personal injury attorney immediately, you will be told the legal steps to take to safeguard your legal right to compensation and seek the justice you deserve. Once a lawyer is contacted and is acting as your representative, they will be guiding your entire legal battle. This will include talking to insurance companies, gathering evidence, collecting police reports and various other legal matters. The accidents involving an 18-wheeler are very different than automobile accidents. Laws and regulations are in place that dictate the driving requirements of an 18-wheeler. 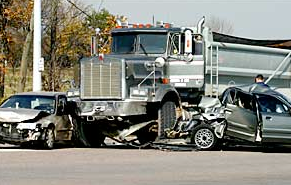 If the driver had a load that was too large or they were negligent in some manner, this may be vital to your case. Being a commercial entity, a lawsuit against an employer will be more rigorous. Without proper legal counsel, harassing phone calls or intimidating letters will be sent to you. As your legal representative, a lawyer will be the main form of contact, which means you are left to recover from injuries without these troubles. Compensation can be received for wrongful deaths, injuries, future wage losses, damages, emotional and psychological trauma, and any other losses incurred. If you’ve been involved in a truck accident in Baton Rouge, or any of the surrounding areas, don’t hesitate to contact us today for more information, and for help on your case.